She only had a h/o well controlled AIDS and hypertension. She had no fever or cough. Her oxygen saturations were 92% on room air. On exam, she had clear lungs, normal heart sounds, and no peripheral edema. A chest x-ray was normal. A bedside echo showed "grossly normal function, good global contractility, no obvious wall motion abnormalities, no pericardial effusion and no B lines present in her lungs." They did not comment on the right ventricle. The BNP was significantly elevated. Hemoglobin and electrolytes normal. After admission, a D Dimer was ordered and returned at 6x the upper limit of normal. A CT pulmonary angiogram showed multiple bilateral superior and inferior segmental pulmonary arteries with central filling defects (extensive pulmonary emboli.) There was leftward bowing of the interventricular septum consistent with right heart strain. The clinicians were cognitively steered down the ACS pathway because of the elevated troponin, and also down the heart failure pathway due to the elevated BNP. 1. When there is hypoxia with a normal chest x-ray, put PE near the top of the differential. Also consider: hypoventilation (including low respiratory drive), vasodilators and sepsis (both of which cause shunting, with V-Q mismatch), and, most commonly, asthma. 3. Positive troponins in unselected ED patients, especially at a low level, are more commonly due to demand ischemia than to ACS. Think CHF, hypertension, sepsis, PE, etc. 4. BNP is elevated in PE as well as in heart failure, from right ventricular strain. 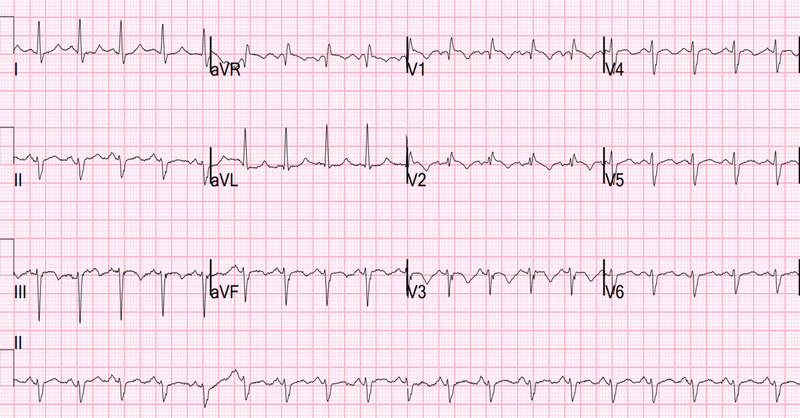 I was sent this ECG without clinical information and asked what it was. My first thought was "pulmonary embolism." All because of the above ECG findings. These are findings of acute right heart strain, and could be seen in any condition which results in a rapid rise in pulmonary artery pressure. This includes hypoxia because of "pulmonary hypoxic vasoconstriction"
The ECG is not sensitive for PE, but when there are findings such as S1Q3T3 or anterior T-wave inversions, or new RBBB, then they have a (+) likelihood ratio and the S1Q3T3, or even just the T3, may help to differentiate Wellens' from PE. Stein et al. found normal ECGs in only 3 of 50 patients with massive PE, and 9 of 40 with submassive PE. Today, however, that number would be higher because we diagnose more of the submassive PEs that have minimal symptoms. This is a paper worth reading: Marchik et al. studied ECG findings of PE in 6049 patients, 354 of whom had PE. They found that S1Q3T3 had a Positive Likelihood Ratio of 3.7, inverted T-waves in V1 and V2, 1.8; inverted T-waves in V1-V3, 2.6; inverted T-waves in V1-V4, 3.7; incomplete RBBB 1.7 and tachycardia, 1.8. Finally, they found that S1Q3T3, precordial T-wave inversions V1-V4, and tachycardia were independent predictors of PE. What is an S1Q3T3? Very few studies define S1Q3T3. It was described way back in 1935 and both S1 and Q3 were defined as 1.5 mm (0.15 mV). In the Marchik article, (assuming they defined it the same way, and the methods do not specify this), S1Q3T3 was found in 8.5% of patients with PE and 3.3% of patients without PE. Kosuge et al. showed that, when T-waves are inverted in precordial leads, if they are also inverted in lead III and V1, then pulmonary embolism is far more likely than ACS. In this study, (quote) "negative T waves in leads III and V1 were observed in only 1% of patients with ACS compared with 88% of patients with Acute PE (p less than 0.001). The sensitivity, specificity, positive predictive value, and negative predictive value of this finding for the diagnosis of PE were 88%, 99%, 97%, and 95%, respectively. In conclusion, the presence of negative T waves in both leads III and V1 allows PE to be differentiated simply but accurately from ACS in patients with negative T waves in the precordial leads." Witting et al. looked at consecutive patients with PE, ACS, or neither. They found that only 11% of PE had 1 mm T-wave inversions in both lead III and lead V1, vs. 4.6% of controls. This does not contradict the conclusions of Kosuge et al. that when T-wave inversions in the right precordial leads and in lead III are indeed present, then PE may indeed by more common. In my experience, this is true, but needs validation in a study of similar methodology. Supporting Kosuge, Ferrari found that anterior T-wave inversions were the most common ECG finding in massive PE. Thanks for this great case! What is the physiologic explanation for the "Q3" in PE? I can see how the S1 could be attributed to late RV activity, like an incomplete RBBB, but why the Q3? And can you explain how a tiny R wave in this case is equivalent to a Q wave? Depolarization forces are primarily superior (lack of significant inferior R-wave) and late forces are to the right (S-wave in lead I). Superior and right is where the RV is. There is also a left anterior fascicular block. good pickup! Is This a Simple Paced Rhythm?